Dr. Rock's Blog & Roll: Album of The Day: Spiral Staircase (5/19/69) 41 Years! Album of The Day: Spiral Staircase (5/19/69) 41 Years! 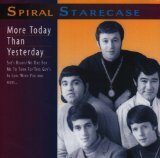 Save for a couple of retrospective compilations, Spiral Starecase was a one-hit, one-album wonder from the late 60s. But that one hit, “More Today Than Yesterday” and the rest of the band’s lone LP are far deeper than most single-shot groups. In fact, many (including me) consider More Today Than Yesterday to be one of the finest of the late 60s upbeat pop-rock albums (the LP was released on May 19, 1969). Unfortunately, Spiral Starecase only got one shot at the limelight; within months of More Today Than Yesterday, the band broke up amidst financial and personnel turmoil. Spiral Starecase began life as a Northern California, Vegas-style lounge act called the Fydallions after winning a local talent contest in Sacramento, CA. Four years on the Ramada Inn circuit perfected their engaging blend of MOR pop, ringing guitar hooks, backing horns and the unmistakable sound of lead singer Pat Upton’s vocals. Their brassy pop-rock mimicked chart-toppers Blood, Sweat & Tears, Chicago and Ides Of March, but minus the obvious jazz influences. However, fame (and fortune) was elusive, as only “More Today Than Yesterday” gathered any respect (#12 in the U.S. in mid-1969) and a second single, “She’s Ready” proved not to be. Upton’s vocals, the band’s great sounds and the overall sunny feel of Spiral Staircase should have gone farther than just one release. To relive what might have been, click here for a preview and mp3 download or CD purchase of More Today Than Yesterday.